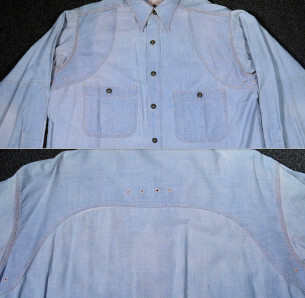 VENTILATED BLUE CHAMBRAY 1930's MEN'S WORKWEAR SHIRT - DOUBLE REINFORCED YOKE & ELBOW - SHRUNK 16 - DISTRESSED! 30's vintage ventilated work wear shirt. Light blue cotton chambray. Long point collar with slightly curved outer edge. Applied button placket. All original dark olive green vegetable ivory buttons (10). Triple stitched, curved double reinforced yokes front and back with overcast ventilation eyelets. Two breast pockets with button closures, one with pencil slot. 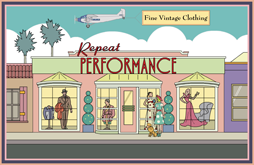 Long sleeves with triple stitching and double reinforced elbows and button cuffs. Triple stitched sides seams. Shirt tails with side seam gussets. Shoulders, measured from seam to seam across back yoke - 20"
Center back length, measured from collar fold to hem edge - 34"
DISTRESSED 30's workwear shirt. Well worn throughout. Collar well worn, frayed and top stitch repairs. 1/2 inch tear near button placket. Overcast repairing at many edges ie. Cuffs, pocket etc. Underside reinforcement repairs at armscyes and pocket corners which serve to extend the life of the garment and are unseen on right side. Well used and worn workwear garment, distressed the old fashioned way... on the job!